Last month, nearly 40 teams and 144 total participants vied for the title of World Forage Management Cup champion. Give these kids credit; taking the equivalent of a forage management ACT test is not what many would choose to do on a day off from school. Most of the participating teams are from Expo’s home state of Wisconsin, but there are also out-of-state contenders. This year, teams from Missouri, Illinois, and Iowa made appearances and each of these states had a team that finished in the top 10 overall. 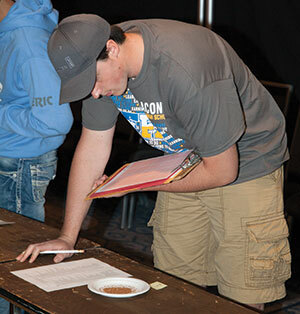 Brady Madigan, Laconia FFA (Wis.), ponders the identification of a seed type. Madigan would go on to finish eighth overall in the contest. His team finished third. 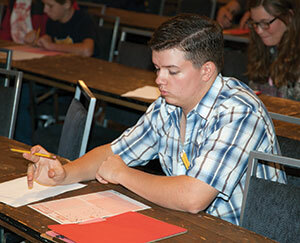 Brady Madigan, a senior at Laconia, has participated in the contest for the past three years. It’s in Madigan’s blood as his dad is an agronomy specialist and sales manager with a large co-op. He plans to attend college and major in agronomy. 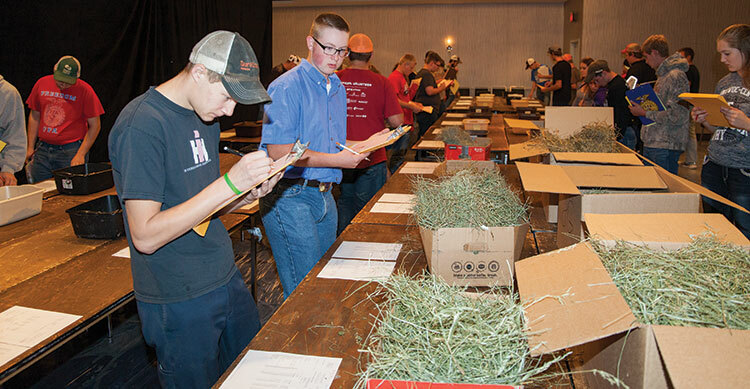 Though Madigan told me prior to this year’s event that he likes the forage judging and plant identification portions of the contest, it was the written exam where he really excelled, achieving a contest high of 96 percent. He finished as eighth-high individual in the contest. Shea Esser is the FFA advisor for River Ridge High School located in southwest Wisconsin. “I competed in the World Forage Management Cup when I was a student,” he noted. This year, River Ridge’s Blake Wegmuller finished second overall and first in the forage judging, while the team nailed down a very respectable fourth-place final placing. “I participated on our team last year and learned a lot about different crop pests and forage quality,” said Wegmuller, who lives on a small beef and crop farm. One of his teammates, Matt Walz, finished 16th overall. Walz has his own custom harvesting business for corn and soybeans, while his brother does custom forage harvesting. While meandering around the students prior to the contest, I sought out the group that had driven the farthest to compete. That distinction went to the team from Halfway, Mo. The town of Halfway is located north of Springfield and “halfway” between Bolivar and Buffalo; its population is listed as 173. Andrew Covert, Halfway FFA (Mo. ), thinks through a question on the written test. Covert finished as high individual in the contest leading his team to first place overall. I found the team sitting against the wall. The unofficial captain, senior Andrew Covert, is from a beef operation where his family also harvests and sells hay. The soft-spoken Covert said that he planned to attend the College of the Ozarks and major in agronomy. “Forages are a big part of what we do,” Covert added. Another member of the Halfway FFA team was senior Michaela Higgenbotham. She had previous experience participating in their state’s FFA agronomy contest and lives on a beef farm where they also make hay. Rounding out the team from the Show-Me State was sophomore Carli Cable, a first-time competitor. “I like plants,” said Cable, whose family has a beef feedlot and also produces hay. As a team, Halfway won both the forage judging and identification portions of the contest, while finishing fourth overall on the written exam. Covert and Higgenbotham finished one-two in plant/seed identification. In placing the forage classes, Covert finished third among all contestants, while Cable came in eighth. The corporate sponsors and organizers of this event, including the University of Wisconsin-Platteville Agronomy Soil Conservation Chapter, World Dairy Expo, and Dairyland Laboratories Inc., are to be commended for their efforts. Though most of the participants are entered as FFA teams, the contest is open to any agricultural youth group (for example, 4-H) with students in the seventh through 12th grades. This article appeared in the November 2017 issue of Hay & Forage Grower on pages 38 and 39.